NEW VAMPIRE VAPE RANGE - KONCEPTXIX IN 60ml* BIG BOTTLES! 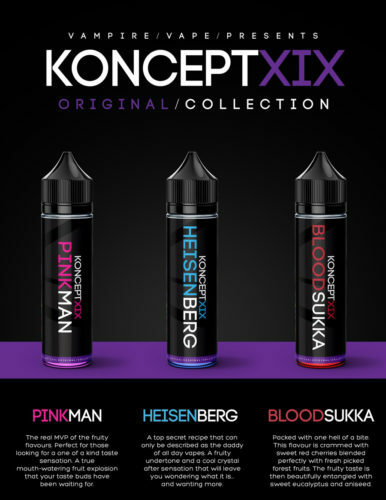 Dragon Vape are excited to add Vampire Vape's KonceptXIX Original Collection series to our ever expanding range of 80/20 big bottle short fills. The Original Collection concept features 3-flavours that mark Vampire Vape's best selling signature flavours. Vampire Vape are the largest manufacturer of E-Liquids in the UK and are one of the most recognised and respected brands on the market today.